Could it be one in, one out at Coleraine? It could be a big week for Coleraine on the transfer front with incomings and departures rumoured for The Showgrounds. 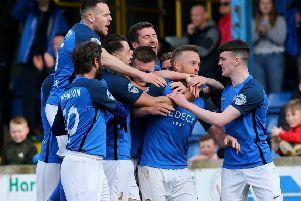 The Bannsiders placed midfielder Darren McCauley on the transfer list at the end of last week after he told the club it was intention not to sign a new deal. Crusaders and Derry City are two of the clubs believed to be showing an interest in McCauley. Boss Rodney McAree is disappointed to potentially lose a player of McCauley’s quality, but said they had no other option after making the player an ‘unbelievable offer’ to re-sign. “I have spoken to Darren and he feels his future lies elsewhere,” said McAree. “Coleraine Football Club have made Darren and absolutely unbelievable offer, the best long-term offer they’ve made any individual. “He’s someone who we don’t want to lose, but whenever someone tells you they want a new challenge we can only do so much. “But I can assure everyone at this club has done all they can to try and keep hold of him. “We have probably waited until now to place him on the transfer list in the hope that he changed his mind and signed a new contract. “That doesn’t look likely to happen and we have to take it on the chin and wish him all the best. “He’s been a great servant here, scored some important goals and been here throughout the big occasions, so we have to wish him well. “He loves this club and loves playing here, but I think he has his mind made up. McCauley didn’t feature in Saturday’s Irish Cup fifth round win over H&W Welders. McAree said he may e involved in this Saturday’s League game at home to Glenavon, if he is still at the club. “It’s something that we will have to look at,” said McAree. “He has all the quality in the world and if he is here next weekend it is something we will have to address. One player who may be coming in is Institute’s star forward Michael McCrudden. The striker has scored 18 goals already this season and is in demand. “We are doing all we can to sign Michael and we would like that to happen,” revealed McAree. “However, we are now led to believe that other clubs are now interested in Michael.